You won’t notice the performance-enhancing machine-learning algorithm at work -- and that’s a good thing. Huawei needs new tricks to differentiate its products from the crowd of Chinese phones permeating the US market, and it's turning to artificial intelligence to set it apart. The Mate 9 is a new Android device that offers a "Machine Learning Algorithm" that purports to learn your habits over time and optimize performance so that the device is more responsive. The Mate 9, which is expected to arrive in the US soon (although the exact timing is unknown), also has one of the largest displays on the market. We don't yet know how much it'll cost in the US, but we expect the Mate 9 to sell for about the same as it does in Europe (€699), which would make it slightly more affordable than other leading big-screen flagships too. That, along with the promised performance boost and supposedly safer battery tech, might be reason enough to consider the Mate 9 as your next large-screen smartphone. 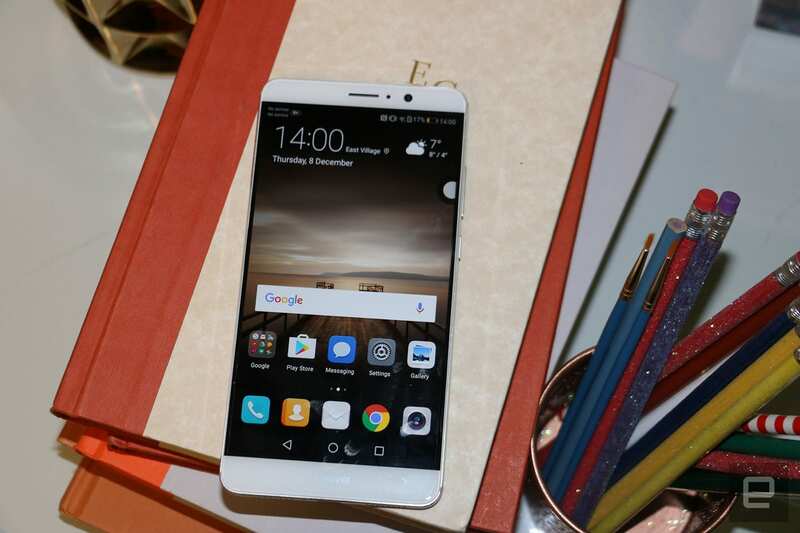 Huawei has proven in recent years that it is capable of crafting a gorgeous device. The Mate 9 is another example of this though its design is reminiscent of other Android phones such as the ZTE Axon 7 and Huawei's own P9. The all-metal unibody, rounded corners, sloping back and shiny silver accents give it a premium, modern look. My review unit is silver, but gray, gold, white and black are also available. The Mate 9 has a relatively large 5.9-inch screen, but the phone doesn't feel much bigger than competing devices with 5.5-inch displays. There are no physical keys on the device's front, and you'll have to rely on software buttons to get around the interface. On the Mate 9's back sits a dual-lens camera, with the word Leica faintly printed in between the two sensors. Below that is a slightly indented pinkie-sized fingerprint sensor; the rest of the phone's matte rear has a smooth texture. The phone's left edge houses a dual-SIM tray, and one of the slots is also capable of holding a microSD card. 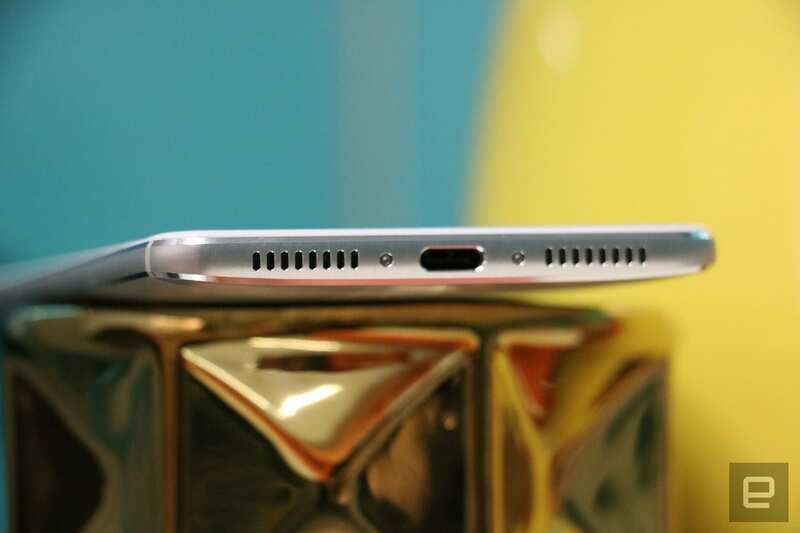 At the bottom is a USB-C port for charging and data transfer, and on the top edge is (you can breathe a sigh of relief here) a 3.5mm headphone jack. Huawei didn't make any drastic changes to its overall aesthetic; this handset looks a lot like its predecessor and the P9 and falls in line with what we've come to expect from the Chinese phone maker. Now, if you want the Mate 9 in a fancier chassis, you should consider the Porsche Design version, which will be available for €1,395 in Europe later this month, and globally (except the US) in January. Despite having the same guts as the regular Mate 9, this model is slightly smaller, and its curved edges make it feel thinner. The all-black exterior and so-called graphite finish lend it a classy, mysterious air -- like a phone James Bond would use. Other than its better-looking frame, though, the Porsche Design Mate 9 is no different from the regular, save for some included themes and Porsche apps. Although it's not as pixel dense as others on the market, the Mate 9's 5.9-inch display still manages to deliver crisp, rich images. The screen's colors are actually nicely saturated for an LCD panel, which usually lacks the deep blacks and high contrast of OLED displays. The pink furniture and orange flames in the music video for Britney Spears' Slumber Party, for instance, looked vibrant and bold. Viewing angles are generous too though darker backgrounds were slightly hard to see when the phone was tilted far away from me. The screen also gets very bright (a scorching 677 nits at maximum intensity), which makes the screen easy to view in most lighting conditions. If, for some reason, you don't like the display's color temperature, you can tweak it through the settings, dragging a slider to make it as blue or orange as you'd like. I liked the original warmth of the panel, so I didn't find this particular feature very helpful. In addition to the default setting, you can choose what Huawei calls "Eye Comfort," which immediately gives the interface a warm, yellowish cast. This is similar to Night Shift on iOS and is designed to reduce the blue light that can interrupt your body's circadian rhythms. The phone's bottom-mounted speaker is also loud enough to fill my apartment with sound, but certain songs, including my current earworm (Oh Lord by Mic Lowry), are lacking in bass. Tracks that are percussion-heavy, like Bruno Mars' 24K Magic, also tend to get slightly tinny at top volume, but you'll rarely need to crank it to the max anyway. Like other Huawei handsets, the Mate 9 runs the company's own Emotion UI 5.0 over Android (7.0 Nougat, to be precise). EMUI has several differences from stock Android, with the most obvious being no apps drawer by default (you'll instead see endless home pages, similar to iOS). However, you can now choose in the settings to use a drawer if that's more your speed. You'll also find more options in the quick settings panel than were there before -- stuff like Huawei Share, Floating Dock and Screen Recording. Floating Dock is a new feature that, when enabled, places a penny-sized circle on the screen. You can anchor this to the left or right side of the display, and tap it to show the home, back and all apps keys that are also at the bottom of the screen. This makes navigating such a large device easier because you won't have to stretch your finger all the way to the bottom to reach the buttons. The latest version of EMUI was streamlined to make it easier to get to common settings. Indeed, nowhere is that more evident than in the Settings app. The blue-and-white theme will take some getting used to, but the new search bar at the top makes finding specific tools more convenient. You'll also get the so-called knuckle-sensing features as on previous versions of EMUI, which lets you knock on the display to outline screenshots or start screen recordings. In place of the typical Android apps like Messages and Photos, you'll find Huawei's own offerings. These are mostly skinned versions of Google's own apps though they give you some additional functionality. For example, the Contacts app has a tool that lets you scan business cards to create new listings. Huawei also threw in some helpful apps like Files, Notepad, Calculator and Phone Manager, the last of which optimizes the Mate 9's performance by closing unnecessary apps and processes. That app also performs virus scans and lets you lock specific apps behind a password or your fingerprint. Along with these useful tools, Huawei also included a small set of unnecessary apps like Booking.com and News Republic. But as far as bloatware goes, this is a relatively short list -- and everything is stashed away in an unobtrusive folder too. Ultimately, the biggest difference between EMUI 5.0 and previous iterations of the software is its machine-learning algorithm, and that's not even something you can see. Weirdly, on that note, Huawei also doesn't let you set your own macros, such as preparing to launch Facebook right after you close Messages. It's not clear if this will ever happen, but it'd be a nice tool for power users. Still, the new EMUI offers a host of ways to customize your interface, which should appease people who want a less heavy-handed UI. Huawei has once again teamed up with famed camera maker Leica to "co-engineer" its imaging system. 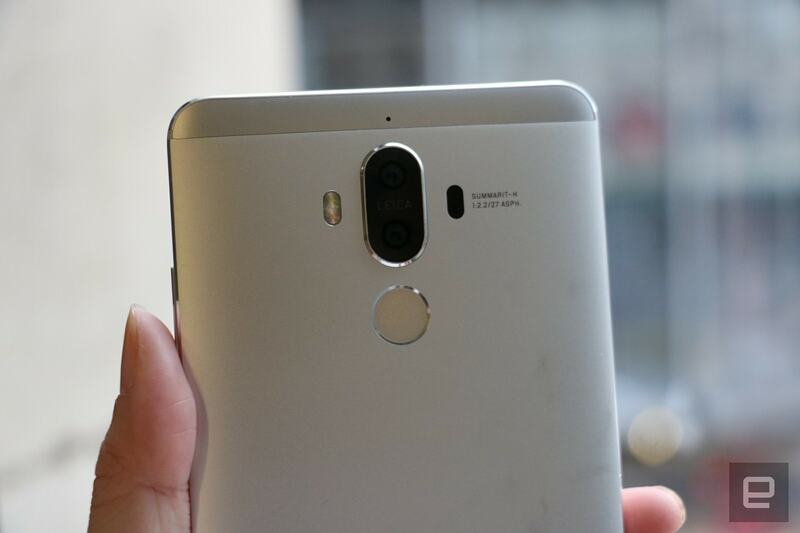 Like the Huawei P9 that was unveiled in April, the Mate 9 has a dual-lens system on its rear that's similar to the iPhone 7 Plus. One sensor captures 12-megapixel RGB data while the other records 20-megapixel monochrome information. Together, they're supposed to deliver rich colors and fine details. I was generally happy with the pictures I took; they were typically sharp though often overexposed. They also generally lacked the vivid colors you'd get from, say, the Galaxy S7 or one of the Google Pixels. Photos taken with the Mate 9 in low light were also grainier than what I got from the other two handsets. As on previous devices, Huawei is offering a Night Shot mode that's supposed to take better images in the dark, thanks to longer exposure. This starts a 10- to 17-second recording session, during which any movement of phone blurs the scene. You'd either have to use a tripod, or sit extremely still for your photos to come out clean. Still, thanks to a wide aperture mode on the camera, you'll be able to achieve a pleasant depth-of-field effect on your shots. Though the rear lenses have fixed apertures of f/2.2, you can play with the software setting here to make it seem wider than that. The feature is also easy to enable and disable; a tap of the aperture icon on top of the viewfinder turns it on and off. This effect works well on pictures of people or food, but slows down the capture of landscapes as the camera struggles to find a foreground to keep in focus. An example of wide aperture mode applied with maximum blur. 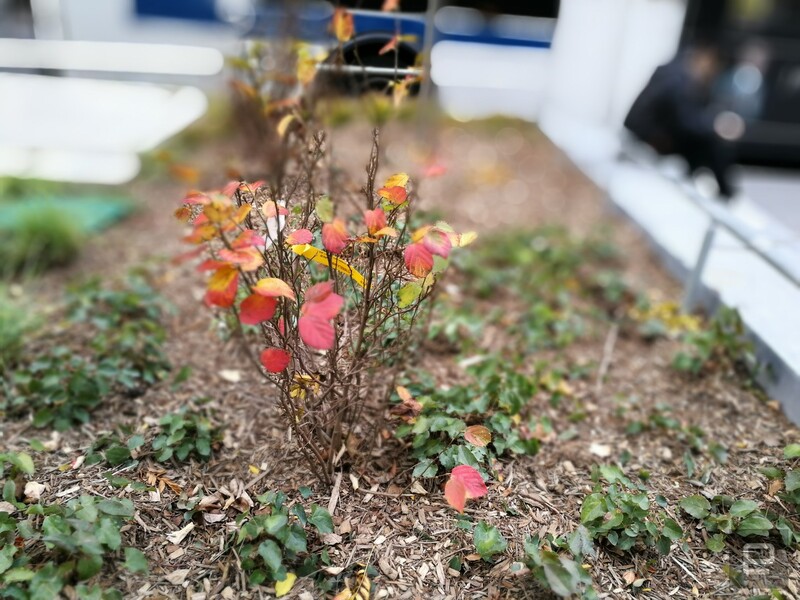 The nice thing about Huawei's implementation here compared to Apple and Samsung's is that the Mate 9 lets you decide how much blur you want before you take the shot. You can drag a slider on the screen to choose just how much background you want out of focus. Samsung's All Focus tool only lets you do that after you take the picture, while Apple's tool doesn't let you customize the level of intensity. Unfortunately, wide aperture mode does not extend to the front camera, where it would have made my selfies pop. Still, the 8-megapixel front camera captured sharp images with mostly accurate colors. Sometimes, when shooting indoors and with Beauty Mode activated, the Mate 9 tended to overexpose, resulting in garishly colored lips and excessive contrast. At its default setting of five on a scale of one to ten, Beauty Mode made people look artificial, with the rest of the image appearing blown out, to boot. Dialing down to level three and below alleviated the problem though. Overall, the Mate 9's cameras are capable of capturing decent photos that are clear and colorful, and that wide aperture mode is nifty, but they won't impress you like the iPhone 7 Plus or Google Pixel will. In a sea of phones powered by Qualcomm's mobile processors, the Mate 9 stands out for using Huawei's octa-core Kirin 960 processor. This allows the company to tweak both hardware and software to offer some extra features, like that Machine Learning Algorithm I mentioned, which promises smoother and more responsive performance. In other words, the Mate 9 will learn your behavior over time and optimize performance so it appears faster to you. Say, for example, you habitually open Instagram right after you close Twitter. The algorithm will remember your behavior and eventually start diverting resources like part of its 4GB of RAM to prepare Instagram the next time you have Twitter open. During my time testing the Mate 9, the set of actions I performed the most were launching the Gallery app right after closing the camera, as well as checking a battery drain application after looping a video on MX Player. The thing is, I couldn't really tell if the overall smoothness I experienced on the Mate 9 was due to artificial intelligence or simply thanks to a relatively new, speedy processor. It's not as if there's a way for me to A/B test that. Jumping from app to app was a lag-free experience, and I noticed no difference in smoothness whether I was opening programs I had previously used or those that I had never launched. I ran a screen recording app while loading up a game and scrolling up and down repeatedly on Engadget's page on Chrome, and didn't encounter a hiccup. The Mate 9's performance on synthetic benchmarks puts it in the same league as leading flagships like the Google Pixel and the Galaxy S7. It beat competing phones, including both versions of the Pixel, the Galaxy S7 Edge and the HTC 10, on the browser-based Vellamo but lost to the Pixel XL and the HTC 10 on AndEBench. The Mate 9 didn't fare as well on graphics-intensive tests, falling behind the two Pixels on 3DMark Ice Storm Unlimited. Even then, the gap wasn't huge. The Mate 9 still outperformed the Samsung and HTC devices on that test too. All of that horsepower is matched by a generous 4,000mAh battery, which Huawei promises will provide 20 hours of continuous video playback. On Engadget's rundown test, which involves looping an HD video with the brightness set to 50 percent, the Mate 9 lasted an impressive 14 hours and 34 minutes. That's 20 minutes longer than the Pixel XL, one hour longer than the Galaxy, and a whopping two hours more than the Pixel. In the real world, that longevity meant I barely had to recharge the Mate 9 (except after battery tests) during my review period. After I left the phone in my purse for two days without using it, I was pleasantly surprised to find that it still retained 80 percent of its power. On a typical workday, too, during which I received notifications throughout the day, snapped a bunch of pictures and uploaded dozens of images to my Google Drive, it sipped power at a slow rate. At the end of the day, the battery life rating had dipped from 57 percent at the start of the day to 36 percent in the evening. 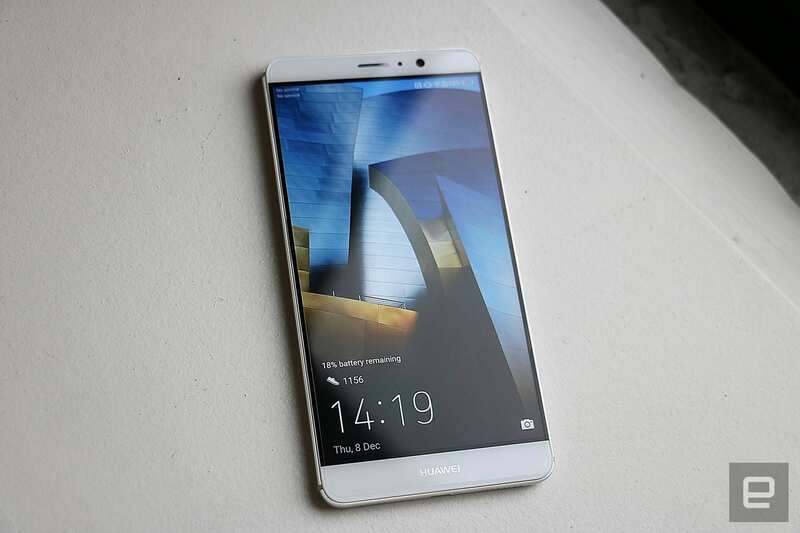 When it did need recharging, the Mate 9 got back up to 55 percent within an hour of being plugged in, thanks to Huawei's SuperCharge technology. That's fast, considering how large the battery is and how long 55 percent can last. Getting through the first 10 percent was slower, though; it took about 20 minutes to fill up. In case you were worried that squeezing a big battery into a thin frame could make the phone susceptible to exploding (as was reportedly what happened with the Samsung Galaxy Note 7), Huawei promises its battery is safe. The company says it uses a five-gate protection system that monitors real-time temperature, voltage and current to "eliminate safety hazards and safeguard battery life." Indeed, during my testing, the Mate 9 never got too warm, even during resource-intensive tasks. It's hard to find comparisons for the Mate 9 when we don't yet know how much it'll cost or when it will launch in the US, but perhaps we'll find out at Huawei's CES press conference early next month. But based on its European pricing (€699 or about $752), it looks like the Huawei phone will go up against the Google Pixel XL ($769 and up) and the Samsung Galaxy S7 Edge (north of $760 through most carriers). While both the Pixel XL and the S7 Edge offer ample, 5.5-inch screens, the Mate 9's roomier 5.9-inch panel will appeal to those who need even more real estate to for easier reading, gaming or multitasking. The Mate 9 also has the longest endurance of the lot. However, both the Pixel and the Galaxy have much better cameras than the Mate 9, while the Pixel in particular runs a cleaner version of Nougat, making it the best choice for Android purists. Ultimately, what sets the Huawei Mate 9 apart is its large screen and excellent battery life. Although the company has been touting its machine-learning algorithm, it's something that you won't notice or think about unless performance starts to suffer. Either way, the Mate 9 is a perfectly capable device. That said, photography aficionados and stock-Android fans will still prefer the Pixel. Instead, the Mate 9 will mostly appeal to those who want a large canvas to watch videos or play games in a phone that's not too hefty. If the handset's US price is close to what it costs in Europe, it could be a slightly more affordable option than some rivals, making it a good value for the performance it delivers.